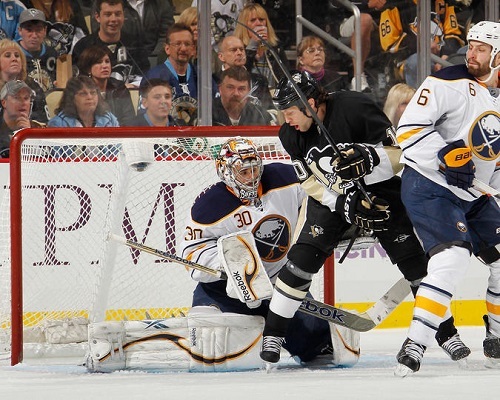 The Buffalo Sabres defeated the Pittsburgh Penguins Tuesday night by a score of 4-2. Thomas Vanek scored 2 goals and now has 20 on the season. Ryan Miller was stellar in net and made 40 saves. Buffalo opened up the scoring in the 1st period. Cody Hodgson made a nice pass to Vanek to beat goaltender Marc-Andre-Fleury to give Buffalo a 1-0 lead. As has been the case several times this season, Buffalo allowed a quick goal. This goal was 20 seconds in fact. A Chris Kunitz shot went off of Miller’s glove and into the net to tie it at 1-1. Thomas Vanek helped set up Buffalo’s second goal. He was battling along the boards against three Penguins players and got the puck. He passed it to Jochen Hecht who beat Fleury and it was now 2-1. A Christian Ehrhoff delay of game penalty allowed Pittsburgh to go on the power-play. Newly acquired forward Jarome Iginla let a one-timer go from the point and beat Miller. Buffalo would have the last laugh in this one though. Mark Pysyk took a shot on Fleury and it deflected up in the air. Steve Ott took a swing at it and batted it into the net. The goal went under review and the referees concluded that it was a goal. Thomas Vanek would later score an empty-net goal. Thomas Vanek now has 8 consecutive seasons of 20 or more goals. The Sabres are 15-4-4 when they score first. The Sabres took 2 of 3 from the Eastern Conference leading Penguins. Buffalo closes out the season at home vs. the New York Islanders this Friday.